You only have to browse through the Fossils and rocks forum to see how many of the suspected fossils put on there turn out to be something completely different! Fossil eggs, bones, turtles, ferns, footprints, you name it, natural rock and mineral processes can mimic it. We call these natural rock and mineral specimens that resemble or are mistaken for fossils "pseudofossils". This post doesn't seek to go through the most common look-a-likes, but if you google "pseudofossil" you will find many excellent guides out there. This post is just some of my personal favourites from the last year. Fun and amazingly co-incidental pseudofossils are one of my favourite parts of my job in Earth Sciences identification. It's got everything - neck, beak, even an eye. But this shape is created by the growth of a mineral upon the rock surface. This shark shape, silhouetted in white against the dark background, would have me swimming for my life if I saw the silhouette peaking out of the sea. But it is just a chance area of cleaner white Chalk against a backdrop of Chalk discoloured by dirt and moss. I can see what they mean, it looks like a guppy with a long flowing tail and fin. But this is a type of the rock flint known as banded flint. Banded flints form a series of roughly parallel lines such as this, which can create all sorts of misleading shapes. The cause is still not fully understood but the movement of water and silica through the flint is thought to be involved. 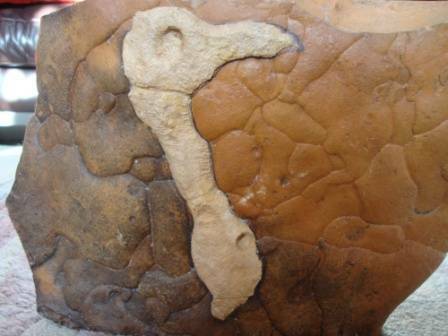 The rock flint can mimic any kind of fossil you can think of - bones, eggs, whole heads and bodies, you name it. Look out for a blog all about the wonders of flint coming soon! 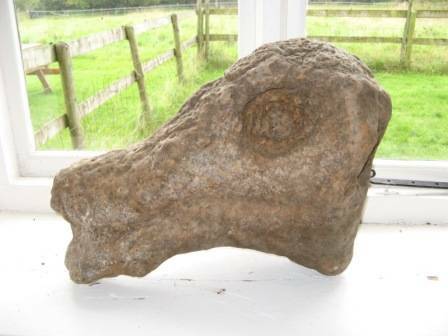 If this were a dinosaur, I can even see what kind it would be - one of the duck-billed hadrosaurs I reckon. Sadly, this is just the shape of the lump of rock, that had probably been exaggerated by weathering. While writing this I've realised that these pseudofossils do have something in common after all. They all demonstrates one of the key things to appreciate when looking for fossils: don't look for the overall shape of an animal. This is because the soft parts of animals like muscle and skin only fossilise very rarely and in unusual conditions. You can assume you won't come across soft part preservation without knowing what to look for and where to look. To find fossils, look for the hard parts such as bones and shells, and bear in mind these are most often broken, mixed up and/or isolated. Although we can say what these aren't, the hardest question to answer is, so why did the rock or mineral form or weather into exactly that shape? There are millions of rocks out there and so even if such coincidental resemblences are rare, there will still be plenty of pseudofossils. And of course those are the rocks that are going to catch your eye and get picked up. So what should you look for? 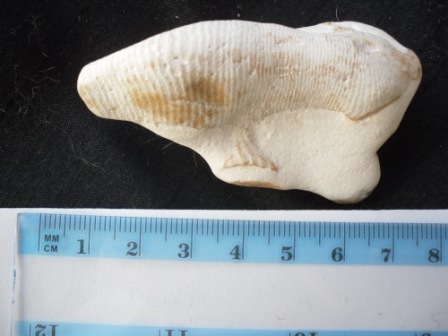 This page on our website has some good information and links for fossil hunting advice. And of course we will be happy to see whatever you find, whether rock, mineral or uncannily-vegetable-shaped-rock on the rock and Fossil forum here. Happy fossil - and pseudofossil - hunting!